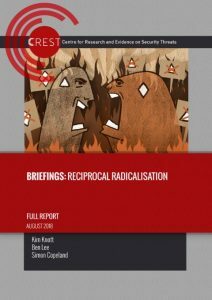 The last time that the concepts of ‘reciprocal radicalisation’ and ‘cumulative extremism’ were a focus of attention for policymakers, practitioners and academics, we wrote two articles in which we sought to adopt the position of ‘critical friends’ (Busher & Macklin 2015; Macklin & Busher 2015). We saw a number of possibilities in these concepts. We welcomed in particular the way that they encouraged analysis of the interactions between opposing groups – something that social movement researchers have long argued is essential if we are to explain patterns of mobilisation and political violence (e.g. della Porta 1995). A need to be clear about the dependent variable. Within the emergent literatures on cumulative extremism and reciprocal radicalisation we identified at least three different dependent variables: escalation of political violence, ideological radicalisation of those identified as being at the core of the process, and wider processes of societal polarisation (see also Bartlett & Birdwell 2013). While these might sometimes coincide, sometimes they do not. As such, without specifying the dependent variable it becomes difficult to evaluate the claims being made and there is a high probability that different researchers and policymakers will find themselves talking at cross-purposes. A need to pay due attention to, and be able to explain, cases where the ‘spirals of violence’ posited at the core of processes of reciprocal radicalisation either do not emerge or are truncated (see especially Macklin & Busher 2015). If we are not able to explain these our theories will generate too many false positives and may inadvertently fuel risk narratives. We should take this issue seriously. Overestimation of risk is likely not only to lead to poor allocation of scarce resources, but also increases the likelihood of provoking “backfire effects” (Lindekilde 2014) and can, through threat amplification, even validate the “clash” narratives that underpin extremist mobilisations. A need to situate the movement – countermovement contest posited as the core of processes of reciprocal radicalisation within a wider set of relationships (see della Porta 1995). In practice, what is described as ‘reciprocal radicalisation’ rarely, if ever, involves just two parties. We are considerably more likely to be able to explain cases where escalation does not take place if we analyse processes of reciprocal radicalisation within the context of wider conflict dynamics. In this very short article we focus on the third of these issues. Specifically, we trace out what we believe to be a potentially fruitful avenue for addressing this issue. If we think for a moment about almost any instance of political aggression or radicalisation, it quickly becomes clear that we are dealing with a complex network of relationships. The most basic contest imaginable that might be described as ‘reciprocal radicalisation’ is one comprising of two opposing groups. If we assume that state actors also play a role, and that the two opposing groups make appeals to some form of nominal public, we have at least four sets of actors already, each of whom will be engaging in some way with one another and also attempting to influence the relationships between the other actors e.g. 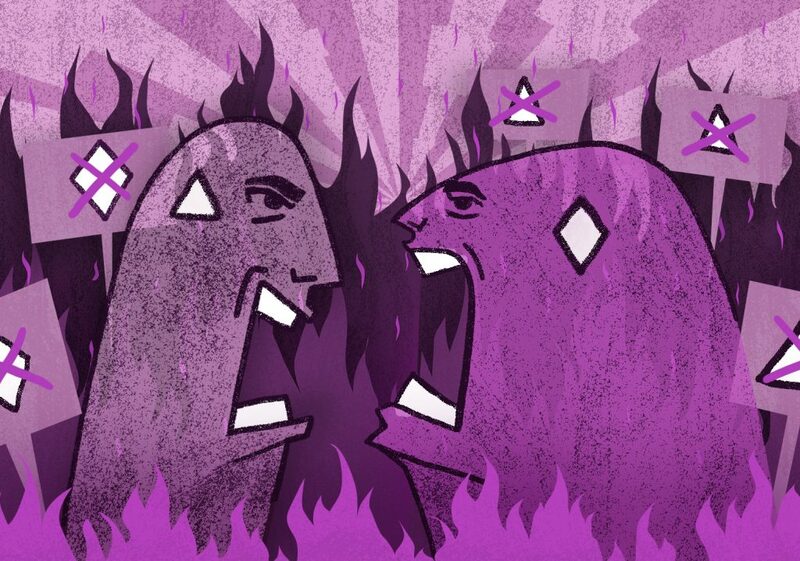 opposing groups are likely to be seeking to discredit one another in the eyes of the wider public and are likely also to be seeking to encourage the state to intervene against their opponents; while the state is likely to be attempting to undermine both groups in the eyes of the public. Of course, such a simple conflict model almost never exists because (a) either those groups are part of a wider movement characterised by varying interests and objectives or there are competing factions within the two opposing groups; (b) the ‘public’ is never straightforwardly ‘general’ but rather consists of multiple segments such that the opposing groups and state actors are in fact engaged with, and usually have to prioritise engagement with, those audiences identified as being most relevant to their cause and to that of their opponents; (c) the state is not a homogeneous entity: activists’ interactions with the security forces are not the same as, and are likely to follow a different logic from, their interactions with elected representatives (at least within a democratic state); and (d) there are often more than two opposing movements e.g. radical right groups in contemporary Europe are not only entrained in competition against extreme Islamist groups but also against an array of left-wing groups. Each of these different actors might take action directly against any of the other actors or might seek to influence the way that two of the other actors interact with one another. As such, while we might acknowledge the need to situate reciprocal radicalisation within a wider set of conflict dynamics, the relational complexity can quickly seem overwhelming. We believe however that recent work on the Dynamics of Radicalization (Alimi, Demetriou & Bosi 2015) offers a way of working through this complexity in a manner that is not overly reductive. The movement-countermovement arena, comprising entrainment between movements and countermovements. These five arenas can provide a useful heuristic device for thinking through the relational complexity of the conflicts that discussions of ‘reciprocal radicalisation’ and ‘cumulative extremism’ often purport to describe. First, it provides a clear framework for situating what is usually described as reciprocal radicalisation within the wider set of relational dynamics. Here, we would propose conceiving of ‘reciprocal radicalisation’ as being coterminous with the movement-countermovement arena (Arena 5). Doing so would help to set definitional parameters around ‘reciprocal radicalisation’ while at the same time situating the processes being described within a wider series of relationships that extend across a set of interlocking arenas (although it is worth noting that ‘reciprocity’ of sorts is also likely to be a feature of other arenas, especially Arenas 2 and 3). In the case of any given conflict, in which arena do we first see the signs or mechanisms of radicalisation or escalation emerge? What, if anything, does that tell us about the relationship between the different arenas within our particular cases? For example, are changes in reciprocal radicalisation dynamics fueling or responding to changes in other arenas? Are we able to identify mechanisms through which escalation within one arena translates into escalation within other arenas? In the context of this short discussion, it is relevant to observe that Alimi and colleagues argue that Arenas 4 and 5 are less likely to “engender processes of radicalization” (2015: 50) – to be the arenas out of which radicalisation dynamics initially emerge – than Arenas 1, 2 or 3. Processes of radicalisation, de-radicalisation and non-radicalisation take place through complex webs of relationships. The strength of the concept of reciprocal radicalisation is that it encourages us to view radicalisation through a relational lens. However, if we are to reap the benefits of this concept we must situate processes of ‘reciprocal radicalisation’ within wider conflict dynamics. Dr Joel Busher is a Research Fellow at the Centre for Trust, Peace and Social Relations, Coventry University, UK. Dr Graham Macklin is an Assistant Professor/Postdoctoral Fellow at the Center for Research on Extremism (C-Rex), University of Oslo, Norway. Alimi EY, Demetriou C & Bosi L (2015) The Dynamics of Radicalization. Oxford: Oxford University Press. Bartlett J, & Birdwell J (2013) Cumulative Radicalisation between the Far-Right and Islamist Groups in the UK: A Review of Evidence. London: Demos. Busher J & Macklin G (2015) Interpreting ‘Cumulative Extremism’: Six Proposals for Enhancing Conceptual Clarity. Terrorism and Political Violence 27(5) 884-905.
della Porta D (1995). Social movements, Political violence, and the state: A comparative analysis of Italy and Germany. Cambridge: Cambridge University Press. Lindekilde L (2014) ‘A Typology of Backfire Mechanisms.’ In L Bosi, C Demetriou & S Malthaner (eds) Dynamics of Political Violence: A Process-Oriented Perspective on Radicalization and the Escalation of Political Conflict. Farnham: Ashgate. Macklin G & Busher J (2015) The Missing Spirals of Violence: Four Waves of Movement–Countermovement Contest in Post-War Britain. Behavioural Science of Terrorism and Political Aggression 7(1) 53-68.